As a smartphone user, you probably check your device’s battery levels at least a few times a day. After all, you want to make sure you have enough juice to be able to play a game while you’re waiting for the subway to take you home from work, right? But what if I told you there’s a cooler way of checking your battery’s status? 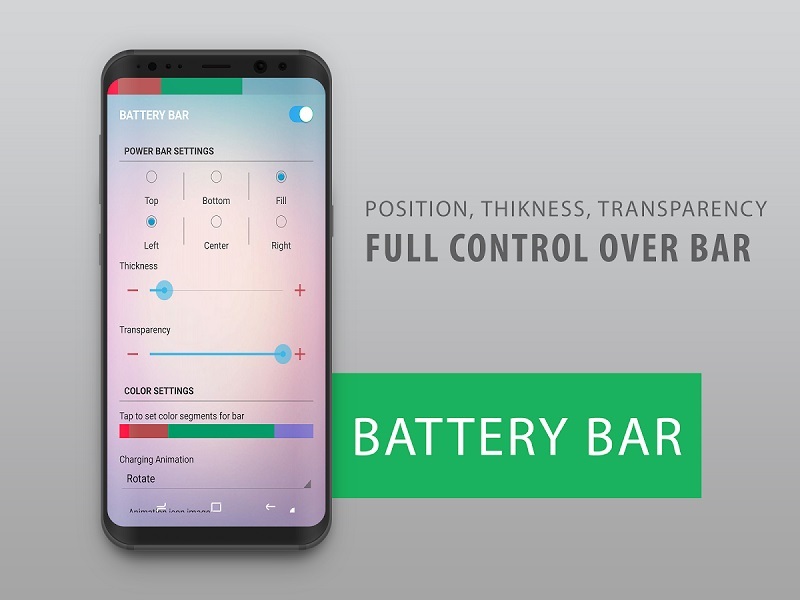 Forget the boring battery icon that sits in the top right corner of your display and say hello to a more colorful battery checking experience. Say hello to Battery Bar. As always you need to download the app from the Play Store (warning: it’s a paid app, it costs $0.99). 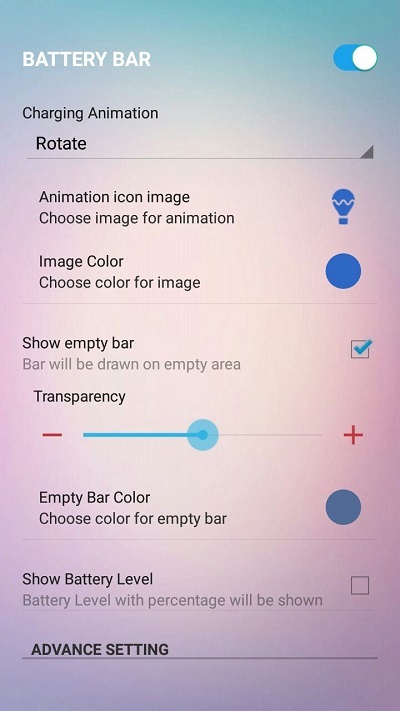 Battery Bar requires system overlay permission in order to draw the energy bar on the Android status bar. 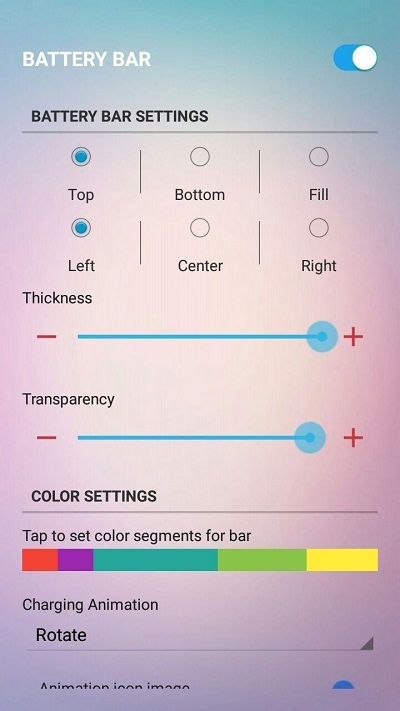 The app basically replaces the plain generic status bar on top with something more eye-catching and colorful. And offers plenty of options to customize it. 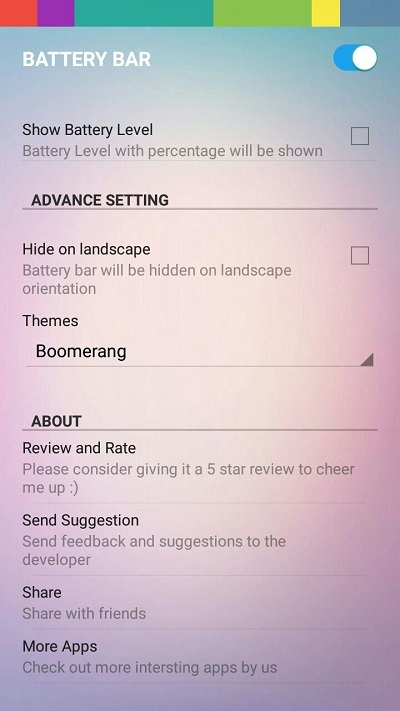 For starters, you can choose how the app displays the Battery Bar. For example, you can have it live on top of the status bar or at the bottom or to fill the whole status bar with battery bar color indicating current Battery level. You can center it, or choose to have it displayed to the Right or Left. The best part is that you get to set the bar’s color segments that help differentiate from 25% remaining or 50% remaining. You also get choose how the bar is divided into the five segments, meaning you can set the percentages. 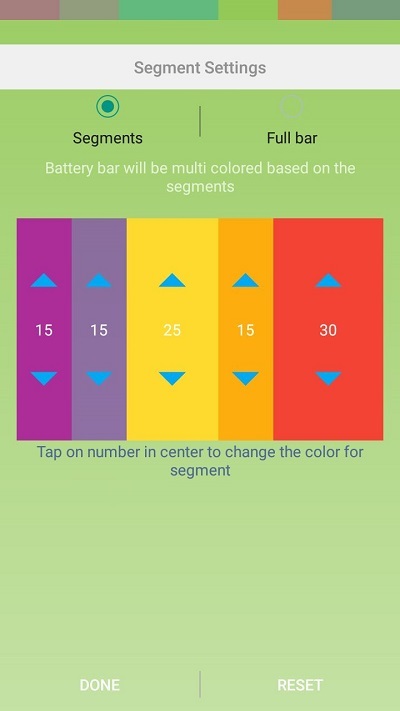 However, the app does not allow you to choose the number of segments. With Battery Bar you’ll have only two options: two segments or five segments – no options in between. 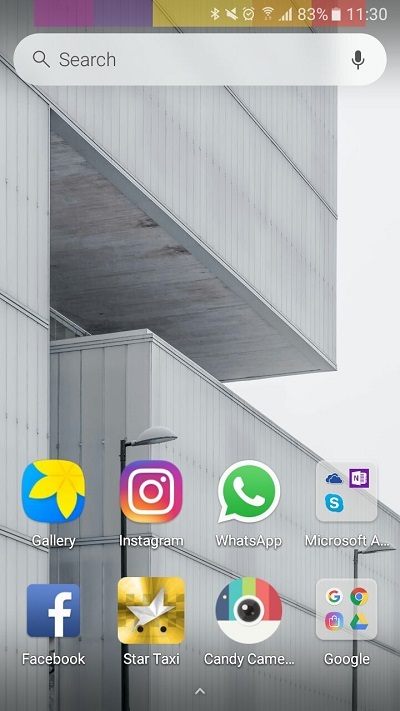 And yes the app plays nice with apps that take up the full screen like YouTube (there’s the option of hiding the bar in landscape if you want that). Once you set the colors, you can tinker with Thickness and Transparency settings. Once you get started, you can try out many different styles and see which one fits your phone’s display better. Furthermore, you’re also allowed to pick a charging pulsating animation which will be displayed in the depleted bar(s). You have a choice between things like a moon, little heart or a smiley face and you also get to set the color and the how the animation is displayed (linear, blink, wave). 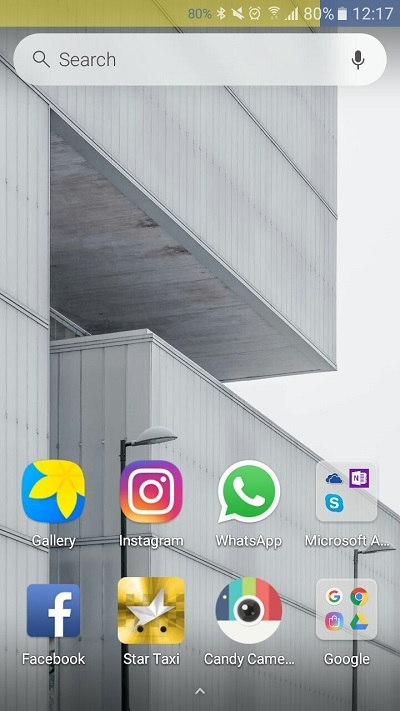 You can also have the app display the exact battery percent you have left (ex: 82%) in a color of your choosing and align it however you want. 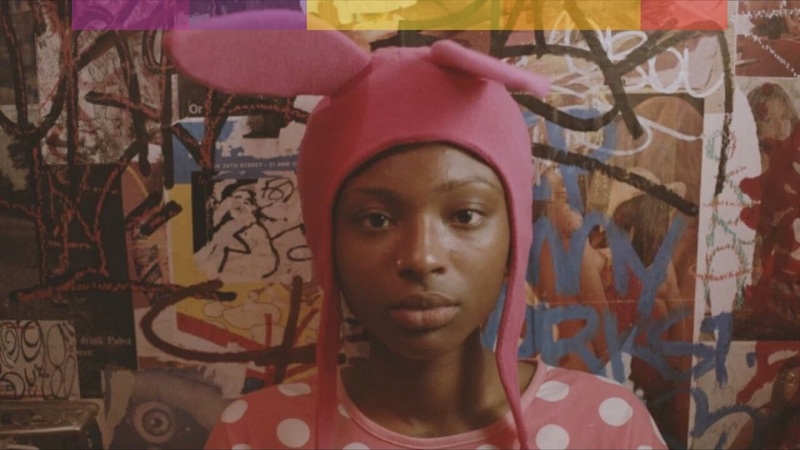 While the app offers a rich palette of customization options, it doesn’t always work smoothly. Perhaps the most annoying part is that the Battery Bar randomly disappears from view, which forces you to fire up the app again. 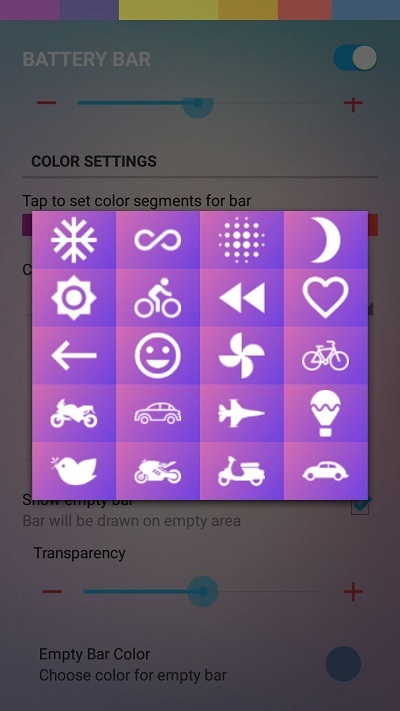 At other times, after setting the segment’s colors, the app would revert them to default gray without much warning. So I had to start all over again. There’s also a Theme feature in the Advanced Options section which doesn’t seem to work, most of the time. I had fun customizing my Battery bar with the app, especially since it didn’t seem to put a toll on the phone’s performance or battery life. The app in itself is easy to use and offers a wide range of tools to help you create a unique Battery bar. More will probably be added with future updates. 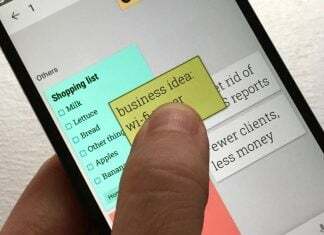 However, there are a few issues that need to be addressed like the disappearing bar, before the app can hope to gain popularity among the Android crowd.